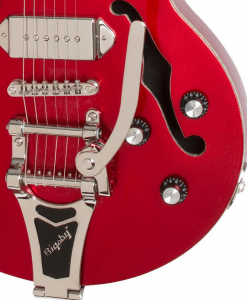 The Wildkat – One of Epiphone’s smartest decisions, or a risky gamble? Epiphone’s journey from a mere ‘affordable Gibson’ brand to its recent popularity has been a fun one to observe. It used to be that you went to this brand when you had no money to drop on a Gibson, but you just had to have those aesthetics no matter what. These days, the situation is different. The brand is expanding in various ways, even introducing some models which are reaching that Gibson standard of quality. One of the most notable additions to their lineup has got to be the Wildkat. This instrument is tearing down guitar stereotypes left and right. How about both? If you know semi-hollowbody and hollowbody guitars, you will know that ‘affordable’ doesn’t go well in the same sentence with any of these two terms. At least it used to be that way. The reason for this was the level of craftsmanship that goes into these guitars, which makes them much more complicated to build than your regular solid body. 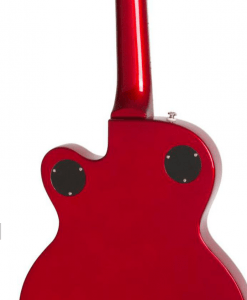 However, they had something to say about that, and they wanted to say it loudly, so they made some adjustments and still delivered a guitar that brings the semi-hollow performance to the budget crowd with prices that hadn’t been seen in the category before. This didn’t go unnoticed, though. As soon as off-the-wall model hit the stores, you could hear the uproar from the conservative side of the isle. ‘It’s not real’ they’ve said, ‘it’s a phony’ and so many other things could be heard. Were they right? This model is not your traditional semi-hollow where you have a center block of wood with a hollow body around it. Instead, it’s a hollowed out solid mahogany body, if that makes any sense. The top is a laminate, covered with a flame maple veneer, which gives it a very authentic feel. The neck is a maple piece that features a modified LP profile and a relatively nice rosewood fretboard. Compared to an ES 335, Wildkat is smaller and much closer to the Les Paul size. In fact, if I had to put it against a previous Epi model, I’d say it’s closer to the ES 339, although there are some significant differences. The question now is, whether or not this is a ‘true’ semi. The answer depends on what you compare this guitar with. If you’re putting it up against a Gretsch G5623 or similar, it looks like a poor attempt at reaching into their market. However, viewed through the prism of the price range it was built for, this is as close as you can get to that vintage sound. And besides, it’s the performance that matters the most, not the aesthetics. Since I’ve already mentioned Gretsch, I have to say that Wildkat is still behind the Gretsch 5120 Electromatic. Epiphone has a lot of ground to cover before these two can be compared. Even so, it’s a step in the right direction. Vintage tremolo bridges with Bigsby tailpieces are a nightmare to deal with, even on top tier guitars. When they released the specs of this innovative creation, many gasped in disbelief at their choice to include these two components on a budget instrument. In all honesty, it was a huge gamble. Let’s be real here, adjusting the tailpiece and the Adjust-O-Matic trem bridge takes a whole new level of patience compared to your standard Floyd Rose. However, I’ve got to say there have been very few issues in this regard. 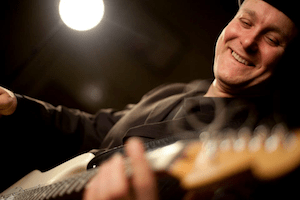 Hardware works just fine, as long as you don’t go wild (no pun intended) with the whammy bar. Some tune up might be necessary since they supplied a rather average set of tuners with this thing, but that is to be expected. In terms of electronics, we’re looking at a set of Epiphone P90 pickups. This is where Wildkat takes a whole different path compared to the ES 339, which features a set of humbuckers. Right off the bat, this sets the backdrop of genres where Wildkat fits in. The pickups are wired to individual volume knobs for both pickups, a master volume, master tone, and a pickup selector switch. A pretty average setup, but a practical one. Now that we’ve covered the specs, let’s get down to meat and potatoes of this slumdog champion. Epiphone definitely rewrote the book on semi-hollowbody guitars, which (seems to irk the snobs to no end) in order to keep the price down and get the instrument on the market. What they managed to do is put the affordable pieces together in a way where it is able to give you a taste of a genuine semi hollow guitar, on a budget. With two P90 pickups, this thing is just made for blues and rock. It has a great range, great projection, and a decent amount of sustain. It even allows you to dwell into the jazz territory, which is a big deal considering that many spend thousands upon thousands on semi and true hollows for that occasion. These pups definitely have a bite in them, but they are well balanced by that body. Does the it sound like a high-end model? Nope, but it’s close enough that it’s worth the investment. As for how the Wildkat ‘sits’ in your hands, I’d say it’s a pretty comfortable ax to play. Even with the Bigsby, you still feel in control. That’s partially due to its smaller size and the fact that Epiphone went for an arched top. While it may not be the best semi-hollowbody ever, it does offer a new angle on the affordable options out there. The deal with these affordably priced guitars is that you have to accept some compromises. Each model offers some attributes while lacking others. In the grand scheme of things, Wildkat is one of the better solutions, which went boldly where only a few dared to go and managed to come out with a one-of-a-kind model on the other side. If you’re on the fence about this model, don’t be. It’s well worth every single penny you invest in it.